While looking through tons of different outdoor toys, we came across the Razor PowerWing Caster Scooter. This unique toy is perfect for doing all kinds of cool tricks that your kid is sure to love. With just a slight side-to-side ride motion, you propel the Razor Powerwing scooter forwards or side-to-side ride. The rear caster wheels on the backs sides allow a full range of motion. Forget about pedaling, the Power Wing launches you off into a world of fun! Read on for the product details. The ergonomic base of the Power Wing cannot be passed up. Instead of constantly pedaling around as you would with a regular kick scooter or a skateboard, this platform allows you to propel yourself with the twist of your feet. The rear caster wheels help guide and direct you while making it much easier to accelerate due to their range of motion. Most wheels either prevent this twisting propulsion, or they make it much, much more difficult since they’re usually bulky and heavy. These small caster wheels are small enough and light enough to allow you to twist back and forth rather quickly, thus making the cruise much easier. Easier cruising means more enjoyment, which is the whole point of these things! On the outer edge of the platform, a triple-striped grip pad helps for traction and a smoother ride. Most competitors forget these foam grips to cut corners, but with this Razor scooter, you can expect nothing but the best. Having a solid area to place your feet while riding also dramatically reduces the chances of slipping or falling. Another key safety feature on this razor scooter is the overall construction. Made with steel from the handlebars to the foot platform, there’s nothing brittle or fragile about it. While many other competitors stick with full plastic builds that crack under the heat of the sun, this Razor Powerwing scooter won’t fall apart. The front wheel is made of hardened polyurethane, which prevents flat tires. Instead of using rubber filled with air that can pop or go flat, these tires aren’t able to be ruined. The rear wheels and caster tires can’t be popped either, making the durability of all three tires the best on the market. The steel adjustable handlebars are covered with foam padding to provide a strong, comfortable grip. Instead of using simply metal as a grip (which causes calluses on your hands), the foam grips are comfortable and provide a cushion while riding around on the Power Wing. Many regular kick scooters rely on your foot to stop acceleration. However, this can be a problem for many reasons. What if you’re riding barefoot? It wouldn’t be comfortable to brake then! Even breaking with shoes on can wear down the bottoms of your shoes very quickly. Think about rubbing the bottom of your shoe on the pavement while going that fast! However, the Power Wing dual inclined caster scooter uses a hand brake system much like a bicycle’s braking system. Simply squeeze the brake (conveniently located directly in front of the foam-padded handlebars) and you’ll gradually slow down. Depending on how tightly you squeeze, you will slow down instantly or evenly. Two removable stability bars on the back of the wing recreational scooter keep the rider aligned and on track. It might be tricky for some people to get the hang of riding one of these since they’re not too common. Think of the removable stability bars as training wheels until you’re ready to ride without them. Removal is easy and intended for anyone who feels comfortable enough to ride freely. Weight and size are always a huge factor in determining who a toy best suits. 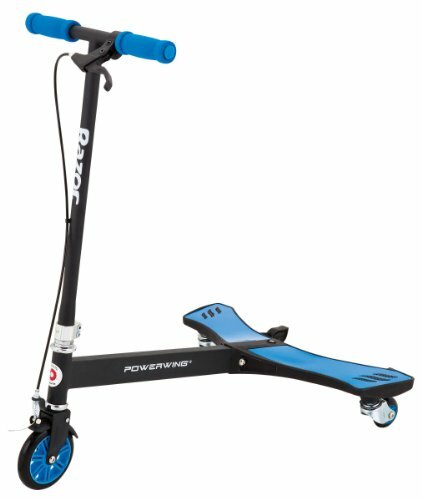 Luckily, the Razor PowerWing scooter for kids comes in at just 12 pounds, which is light enough for almost any rider. It’s very close to the same weight as a normal kick scooter. The 32″ x 22″ x 34.5″ dimensions make it the perfect size for almost any kid. There’s not much of a height requirement since it’s below 3 feet tall. The only thing you need to make sure of is that your kid’s back feet can reach the outer foam grips on the platform while they hold onto the adjustable handlebars. Again, these smaller dimensions shouldn’t present any problems at all. The Razor Power Wing is suitable for anyone looking for an alternative, unique style of playing outside. While bicycles, a recreational scooter or electric scooter, and skateboards are all perfect for outside activity, there’s so many of them already. If you want your kid to stand out and feel unique and cool, these 3-wheeled scooters are a great solution! The twisting acceleration maneuver is a great exercise to keep your kid in shape. They say that one hour a day of outside play is the answer to growing up healthy and strong. Well, what’s a better way to get your kid outside than a Power Wing scooter? With multiple colors and stabilizing features, these Razor Powerwing scooters are meant for kids of all ages. If you’re worried about your kid’s safety, the stabilizing bars will keep them out of harm’s way while they learn how to navigate their new toy. Choosing between the two colors of blue or sweet pea gives you the option to suit your kid’s preferred selection. Finding unique gifts and toys for kids is no simple task. Everyone usually thinks of the same items every time, making it difficult to not buy the same thing. One of the worst results of gift shopping is buying someone something that they already own, everyone knows that! While searching for something unique and nearly unheard of, we came across the Razor Powerwing scooter for kids. Since they’re so rare, the chances of you buying them one of these and them already having it is slim to none. Not to mention the fact that if they did own one of these, then we’re pretty sure you already know of it. Worst case scenario they now have two wing scooters, which isn’t too bad! With all the indoor video game distractions, getting a kid outside to exercise is now one of the most challenging tasks around. They usually look at outdoor activities as a chore, and they just want to get back to the TV screen. However, with these awesome inventions, they’ll want nothing more than to get back outside playing around. As we said earlier, the goal is one hour outside of play a day, but with these things, they might far exceed that goal! The Razor Power Wing is a scooter for kids, which most little ones love. However, for the kids that also love skateboards, or prefer them over scooters, another great option is the Razor Ripstik Ripster. It works the same way that the Power Wing does but in a skateboard form. They’re also a great way to learn how to skateboard since they’re always testing your balance. Twisting back and forth on the Ripstik Ripster propels the rider forward or side-to-side ride depending on which way they lean. It does have a learning curve, but once your kid gets it down, they’ll love the experience. Not to mention that this super rare skateboard alternative will make them look way cooler, which we all know is a high priority at that age! With the constant twisting and leaning back and forth, there’s no better way to strengthen your balance and even learn how to skateboard. 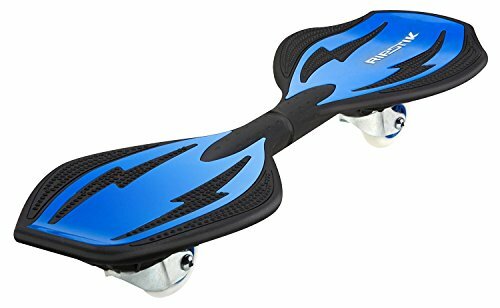 After your kid learns how to hold themselves up on one of these Ripstiks, they’ll have no problem standing on a skateboard. That being said, getting them off of this and back on to a regular skateboard might be a challenge simply because they’re so fun to be on. In the end, it’s all about finding the right toys to get your kids outside playing, exercising, and enjoying the fresh air just as we all did when we were younger. It’s time to put down the controllers and remotes and get back to the healthy, strengthening exercise that comes with outdoor adventures. The Ripstik and the Power Wing by Razor are both excellent solutions to get your kids outside playing and enjoying life the way it should be enjoyed when they’re young! For other options from Razor, consider the Ground Force Drifter toy which helps in mastering sideways drifting! The Razor Pocket mod is also a fun choice for something a little tamer. The Razor A6 scooter is a more recreational scooter for those that know what they like. Razor also offers the MX500 Dirt Rocket electric motocross dirt bike – which we love. However, the Razor Dirt Quad is a popular choice due to having 4 wheels! Lastly, we’d like to mention the amazing Razor Crazy Cart – another Razor product that includes fun sliding in the form of a drift. Razor products seem to be well known for helping little ones when mastering sideways drifting! Of course, Razor products are well known in the pro scooter, electric scooter and trick scooter world – check out our favorite Razor pro scooters here.